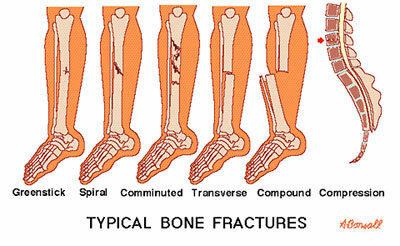 Fractures are classified as a break in the continuity of a bone. 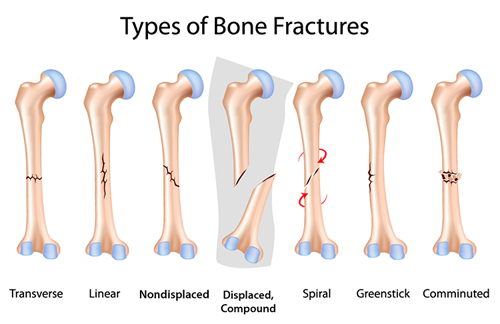 There are many classifications of fractures, locations and angles and breaks. For example if the skin is intact it is considered a closed or simple fracture. If the broken bone pierces/breaks the skin it is considered an open or compound fracture. Fractures that are open to the outside are more prone to infection. Other fractures are known as transverse, oblique, spiral, comminuted, avulsion, osteochondral, compression, greenstick, perforated and stress fractures. Treatment will consist of gradual muscle strengthening as this increases bone strength, and decreasing scar tissue that may have formed around the fracture. Decreasing any pain and tenderness while gradually increasing range of motion as well. If you have any questions about fractures contact our staff at Dynamic Physiotherapy.